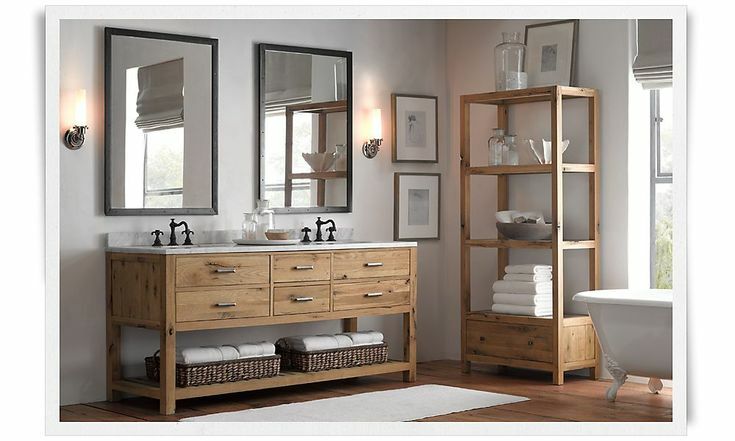 Bathroom Vanity: To Renovate, Replace or Just Renounce? Bathroom vanities are really the heart of the restroom, kind of in the same way that The Dude’s Persian Rug really “tied the room together” in The Big Lebowski movie. A toilet and shower work together with other accessories to give an overall vibe to the room but it’s the bathroom vanity that is the focal point. That being said, one of the most popular home improvement projects is upgrading said vanity, whether it be via replacement, refinishing, or part of a complete remodel. Here are some of the factors to weigh when choosing what option is right for you. Poor Shape – In some cases the bathroom cabinets are just too far gone for even the most experienced renovator to salvage. There will come a time when it’s simply the best option just to tear out the beat up vanity and start anew. This also applies to a chipped vanity countertop or attached backsplashes that have become an eyesore. New Faucets – Making the switch to more energy efficient plumbing fixtures throughout the home is highly recommended, although the change-up may come at the cost of your current bathroom designs. Even though purchasing a new vanity represents added overhead, if it enables lower utility bills then over time a good majority of the costs can be recouped. Want New Style – Depending on the overall décor of your home, it may simply be time for a fresh look in your bathroom. Newer bathroom fixtures feature dual-sink vanities that can greatly reduce the time it takes multiple family members to get ready in the morning and adding more storage in a vanity cabinets can give more space in the rest of the room. There are some other popular reasons for completely switching out the bathroom vanity such as it makes it easier to lay down new tile or it has undergone water damage from a leaky source. Budget Friendly – Purchasing a brand new vanity and having it installed professionally is a project that can cost upwards of $1,000. On the other hand, hiring a renovation company to re-sand the cabinet doors and install new faucet fixtures won’t set you back more than about 2 days of labor. The money saved on buying a vanity can be put towards modernizing the bathroom light fixtures and other appliances. 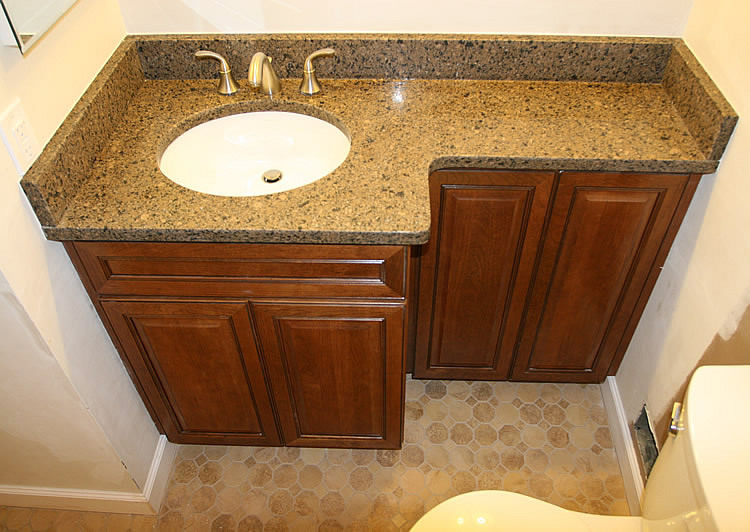 Environmentally Beneficial – Throwing away an old vanity countertop takes up a lot of space in landfills and when combined with old toilets and tubs a bathroom remodel can be a very environmentally damaging project. Fun Project – Bringing an outdated vanity back to life is a great way to show off your creative side in addition to saving money and easing environmental pressure. Thinking outside the box or finding cool ideas online to give the bathroom a makeover is a great talking point for guests and can get you started on the way to other DIY projects. Much like other projects around the house, a number of things must be taken into account when deciding on how to tackle a bathroom vanity. Budget, city codes, and current home décor all determine the best route for homeowners. That being said, it doesn’t have to be the black and white decision of whether to purchase new or renovate. For instance an old clothes dresser or cabinet can be fashioned into a vanity or there could be none at all with a free standing sink. Make sure you’re comfortable with your decision, after all you have to look it in the mirror each morning. Most people will often prefer to create an entirely new bathroom space for relaxation or just an upgrade of the existing bathroom. Transforming an existing bathroom to a modern may need a little research, creativity and witty ideas… We hope that the below pointers will serve you well when planning and and laying out your bathroom renovation ideas. Tiles or paint? – First and foremost you need to determine whether you want to tile your bathroom walls or paint them.For the homeowner trying to renovate his bathroom space, in the shower area, it’s better to tile all the way up rather than a painted drywall. Why you ask? Well tiles are easier to clean and they bring a better sparkle to your bathroom.Tiles also bring a fresher and superior feel than paint, but of course, it entirely depends on the preferences of the owner. We all have different preferences, so just in case you prefer to paint your wall rather than tile it all the way up, go for the high quality gloss bathroom appropriate paint, preferably water -resistant ones. Bathroom Flooring - when it comes to bathroom flooring you have to go for quality long lasting flooring. For example, laminate flooring is not very ideal for the bathroom compared to ceramic tiles and sheet vinyl which are great for bathroom floor and will give you a fabulous sheen and sparkle. You can even consider putting marble floors on your bathroom to make it much more exquisite. Removing stains from the floor and walls - to remove paint, permanent marker and stains on your bathroom floor or wall use denatured alcohol or acetone.In cases where your bath tub or tiles have stains due to hard water, use a cleaner that works perfectly in removing mineral deposits, calcium or iron found in hard water. Adhere to the directions given, although most of the cleaning chemicals will hardly damage the gel-coating on your painted walls (in case you have a painted bathroom wall). Clean your bathroom walls regularly. Soap scum will peel off your paint if it accumulates for long periods. By doing this, you maintain the luster and sparkle on your bathroom floors and walls. Remember to use a freshener to keep your bathroom fresh all day! Avoid permanent placing of objects - remember, it’s all about making your bathroom maintain its luster through the years that’s why you need to completely avoid leaving objects or products permanently on the floor space because they discolor the surface.Try avoiding scratches on your marble floor and wall by using felt padding on the sharp-edged items. In case your surface is scratched, use liquid cleaning and polishing compounds like Gel-Gloss to get the glow back. It removes water spotting, soap scum on you floor while at the same time sealing glass surfaces. Bathroom colors and mirrors - choose the perfect color, color that is light and easy on the eye because we usually associated color with mood. You find that when a bathroom is painted in colors like light blue or light-yellow, both with a touch of white, it’s more appealing to the eye and provides an ambiance of pure serenity. It’s very hard to make dark colors work out in a bathroom. In fact it’s very advisable to give up the entirely classic white bathroom altogether. Most bathrooms are small so put up mirrors as design elements to add light and expand your bathrooms perceived space. Painting - Bathrooms are very moisture intensive because of the hot showers and steam. So when painting your bathroom walls to get the sheen back, remember it’s not like any other room.The paint used must be resistant to moisture as well as contain mold-inhibiting agents for the ideal finish and sheen. Note that, painting your bathroom trim in variations of white can make your whole color scheme look a lot more crisp. When thinking of remodeling your bathroom, it’s important to focus on achieving a fresher and newer look. Also keep in mind that bathroom renovation is no simple undertaking as it needs comprehensive planning and hopefully, seamless implementation of the plan of action. Depending on your end goal, bathroom remodeling could be one of the most costly investments you can throw in to add your home’s value or could could also be the cheapest one – results may vary. The results you’ll achieve will depend on how much you want to spend, the existing condition of the bathroom you want to renovate, and the extent of the renovation work. Think of it this way, if you’re looking for a complete bathroom remodel, you’ll most-likely spend more but if you’re only looking to refurbish the surface, you’re costs will most-likely be slim. Think of how much you’re willint to spendBefore remodeling a bathroom, start off by deciding how much of your income will be allocated for the renovation budget. Aside from the fact that proper budgeting impacts the selection of materials you’re going to use, it also allows you to set clear boundaries of the renovation design you want. Understanding how much you can afford over this bathroom renovation project is absolutely necessary to decide what specific areas needs renovation or replacement, as well as what simple things can be done by you. Keep some items, as much as possibleMost of the time, renovation comes with full make-over of the area, and this is also applicable in our bathrooms. However, if there are certain things in the bathroom that can be reused, such as an old cabinet that is still in good condition, use it rather than replace it. You can also give that cabinet a fresher look by painting it to match it with the aesthetic of your newly renovated bathroom. This way, you’re cutting up on the costs of materials as well as go “green” with your creative innovations.Keeping items reusable is also applicable in bathtub, shower, tile, or sink. If you think these stuffs are still in good working condition, then there’s no need to totally tear up your bathroom for a complete renovation; simply refinishing them would do the job. Don’t move electricity or plumbing linesOne of the most expensive ways to renovate a bathroom is to completely make-over whatever is in the exterior and interior, including the plumbing and electricity. If you’re going to move any of these, make sure that you’re prepared for the costs and the delay it would cause. In addition, if you’re going to spend less – or not spend at all – on plumbing lines and electricity, you could still use that budget you have for other remodeling works around the bathroom. Choose bathroom floors carefullyTwo important things to remember when replacing bathroom floors are the safety and cleanliness. The moisture on bathroom floorings is the main reason why bacteria/fungus builds up and accidents happen at some point. Choose tiles carefully. Those that contain sand glazes and textured are usually non-slip and offer better grip than other kinds of tiles. But if you want tiles that easy to clean up, you can go for glazed or porcelain tiles, because they absorb less moisture and less stained. Don’t forget the lightingDo you know that adding up a good overall lighting on a bathroom can make the room appear more spacious and larger? Plus, lighting is very important in a bathroom, so you have to include them in your bathroom renovation plans as well. Install lighting at the most appropriate spots so you have adequate lights around the area, especially if you are shaving, wiping off make-up, or simply relaxing in your tub. Another reason why people go for bathroom renovation is because they want to experience a new ambiance inside it. Thus, painting off the walls with new, lively colors is always a good choice for many. There are some things to consider before painting a bathroom, though. First, if your wall is covered with wallpapers or an old paint, make sure to remove them evenly before applying a new paint. See to it that the walls are clean and free of moisture and mildew before painting it. Finally, always place masking tapes on the edges that you don’t want to get painted to make walls more cohesive and presentable. Can you simply refurbish an old bathroom cabinet or drawer? Do you know how to replace cracked, loose tiles with a new one? Do you have some skills in painting? Are you equipped with some high-level of creativity to give your bathroom a stylish yet cheap new look? If you got some of these skills, then you could really save a lot on your bathroom renovation expenses, because you will only have to worry about those renovation issues that need serious help from professionals. Some basic reminders about bathroom accessoriesBathroom accessories, such as towel bars, cabinet with mirror, sinks and tissue holders must be placed at the right height. This gives us easy access to them whenever we need them. Decide how high the towel bars, cabinets and sinks should be – It’s important that during bathroom renovation, proper spacing and placement of such accessories be prioritized first so you can have additional space when finishing off floor tiles replacement.